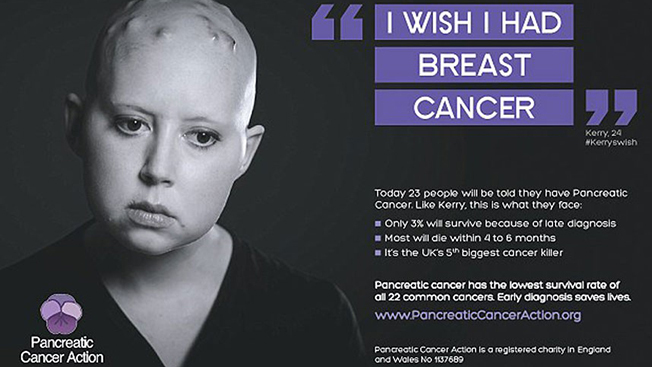 Pancreatic Cancer Action has issued a thoughtful, heartfelt defense of its controversial U.K. awareness campaign that shows sufferers saying they wish they had other types of cancer with higher survival rates. One print ad in the series uses a quote from 24-year-old pancreatic cancer patient Kerry Harvey—"I wish I had breast cancer"—as its headline and notes that the survival rate is only 3 percent, the lowest among all 22 common cancers. "With a limited budget, it was vital that the advert would stand out and provoke thought and initiate discussion among members of the public, the media and influencers," PCA chief executive Ali Stunt writes in the Daily Mail. Stunt says the work, from Team Darwin, "reflects the genuine insight of many pancreatic cancer patients upon diagnosis, and how it feels to be diagnosed with a disease that leaves you with no hope at all." • Breast Cancer Campaign CEO Delyth Morgan says she was "shocked and saddened" by the initiative. "While the intention of the campaign is great, the adverts are hugely upsetting and incredibly insensitive and divisive." • Breakthrough Breast Cancer chief Chris Askew said his organization would "strongly dispute any message which suggests that one type of cancer is preferable to another," adding, "I've yet to meet a man or woman with breast cancer who would consider themselves in any way fortunate to have received a diagnosis." • Writing on cause-marketing blog Osocio, Reuben Turner, whose grandfather died of pancreatic cancer, calls the ads "the last resort of the desperate," though he concedes this: "Maybe that's the point. Maybe these people are desperate. Desperate for attention. Desperate for funds. Desperate for a cure." PCA executive Stunt has known such desperation firsthand: "When faced with a 3 percent chance of surviving more than five years, it is not unreasonable to wish for a cancer with a better survival rate. This is exactly how I felt when I was diagnosed with the disease in 2007." "The attention this campaign has received," she adds, "has also paved the way for a symptoms-awareness campaign that we launched on the London Tube this week. Our aim is to save lives, and that is achieved by early diagnosis, which come from creating awareness wherever and whichever way we can."